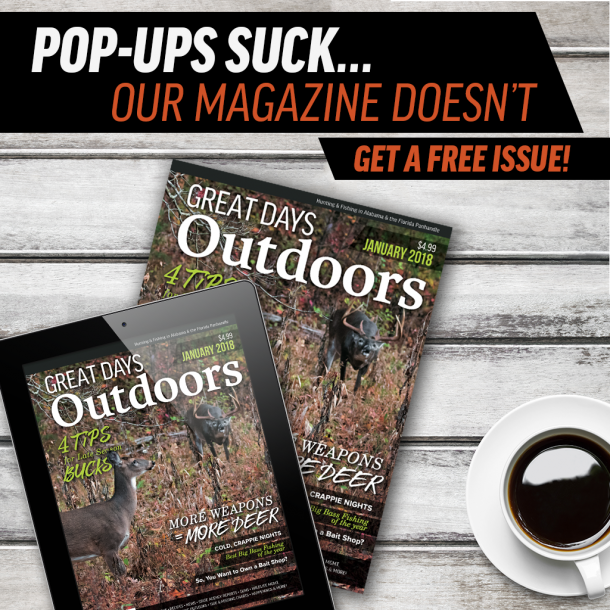 The outdoorswoman no longer defines hunting as enjoying nature and spending time with husbands and children who hunt. Gender roles are changing. For years, the effort to get in touch with our primitive selves was a male-dominated activity. Then came outdoorswomen like Judy Rhodes, Brenda Valentine, and Georgia Pellegrini. As these women gained name-recognition, they pioneered the way for the outdoorswoman. They encouraged state departments of natural resources to begin hosting workshops for Becoming an Outdoors-Women (BOW) that offer instruction in skills such as archery, shotgun, and rifle shooting. Among those who have imbibed that tonic is Georgia Pellegrini. Pellegrini was once an investment banker who became disenchanted with her career as a financial advisor with Lehman Brothers. 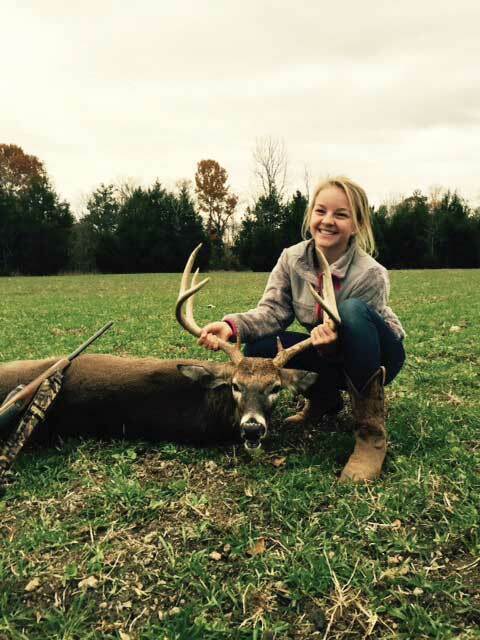 As she puts in Girl Hunter, she was “determined to nourish my soul again.” She manages Girl Hunter Adventure Getaways where an outdoorswoman can learn fly-fishing, ATV outings, and pheasant hunting. “We were meant to participate in nature rather than keep it at arm’s length,” she says. Tinley Bailey with a nice 8-point buck. Though men still account for the majority of the 13.7 million U.S. hunters, more women than men are taking up hunting. According to the National Sporting Goods Association, 163,000 new female hunters have been added in recent years. At last count, Census Bureau statistics show that 11 percent of all U.S. hunters are women This is a nice increase from nine percent in 2006. In her book, Modern Pioneering, Georgia Pellegrini offers a variety of tips—how to turn Mason jars into lanterns, how to use a compass, how to make lip gloss from beet juice. The book’s slogan: “Self-sufficiency is the ultimate girl power.” She helps women seek clarity and peace of mind by casting aside the trappings of modern civilization. “Attending the Girl Hunter weekend is only partly about getting back to nature; much of the appeal has to do with getting away from the grind,” she says. Pellegrini says hunting can also have a softer side to it. “It can be stylish, edgy, and alluring”. While trekking through high grass with dogs and firearms. Carrying gift bags overflowing with beef jerky, ball caps, and baubles from SureShot Jewelry (made with the casings of spent shotgun shells). The cabins have fluffy beds and satellite TV. “They want to feel feminine while they’re doing this,” she says of her guests. Her Girl Hunter edition in 2012 is laced with recipes for dishes like elk jerky, squirrel dumplings, and balsamic deer heart. It focuses on the transformative power of hunting, gutting and eating wild animals. Many hunters say their hobby of hunting creates a sense of intimacy and respect for both the animals and their habitats. 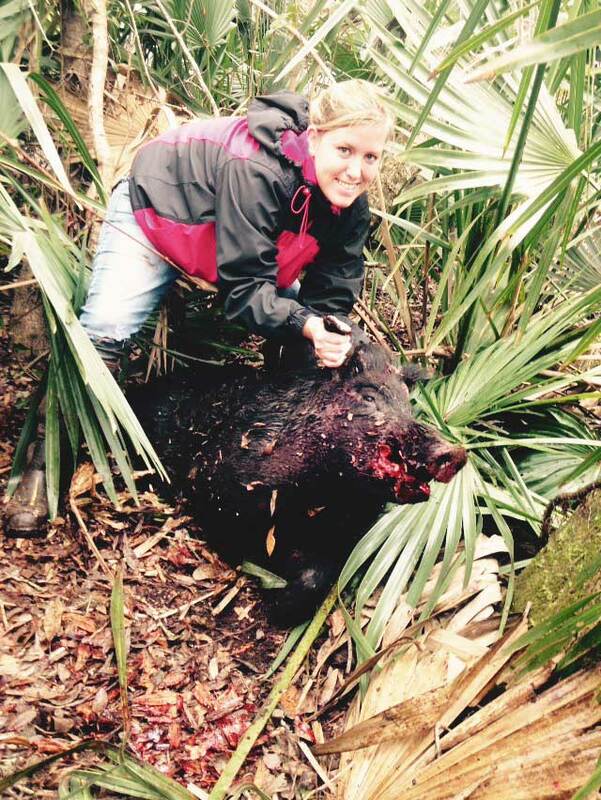 Stacy Lollar and wild boar she killed. According to the National Shooting Sports Foundation, gun-store owners report a 73 percent increase in female customers. Single-parent woman with children run one in three homes in America. Most of these women want to learn about the outdoors. WOW founder Rhodes personally teaches over 500 women per year how to shoot a shotgun. With shooting groups like hers for women only, it’s now easier for women to get involved. Gun manufacturers are including smaller sizes, color options, and elements that reduce user fatigue. The Flashbang bra holster, in particular, was a popular item at the SHOT show in 2013. Many men may still think that an outdoorswoman may be lacking in bravado. Consider Mandy Stokes who made the kill shot on a massive 15-foot, 1,011-pound alligator with a 20 gauge shotgun on the Alabama River during August 2015. She and her husband and two children endured a five-hour battle. The fight almost wrecked their boat when the gator towed it over stumps in a creek. Safari International recognized her gator as the new world record. In early December 2015, novice shooter Taya Kyle stunned audiences. She scored 100 percent of her shots in the American Sniper Shootout. The prize given by TrackingPoint was $1 million dollars. She is the widow of legendary Navy SEALs sniper Chris Kyle. After the competition, she also made a 2,100-yard shot with her XS1 rifle chambered in 338 Lapua Magnum. It was the same distance as the shot her husband took in 2008, killing an insurgent about to fire on a U.S. Army convoy. According to National Geographic, women dominate household food and nutrition decisions. With large-scale factory farms concentrated in a few regions, local meat can be difficult to find. According to the U.S. Fish and Wildlife Service, every year nearly $200 million is distributed from the federal taxes associated with hunting to support wildlife management programs.